The competition is free and open to everyone. We encourage designers, artists, engineers, architects, landscape architects, university students, urban planners, scientists and anyone to enter who believes that the world can be powered beautifully and sustainably. early three times the size of Central Park, what once was the world’s largest landfill will become the City’s largest park. The complete transition will be taking place over the next decades in stages, and the park is designed to be a symbol of sustainable natural ecology within the context of our constructed environment. The site is expansive to allow for maximum creativity. 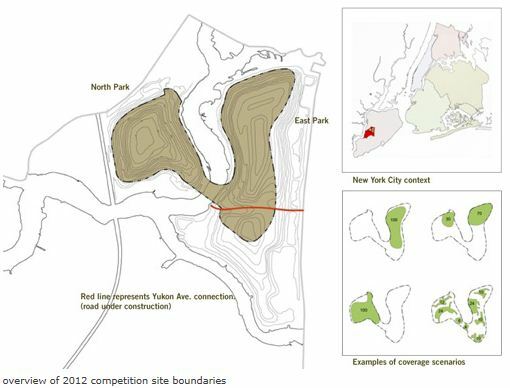 Proposals may cover up to 100 acres and artist teams can choose where to place their design within a 300 acre area (shaded above) that extends over both the North Park and East Park sections of Freshkills Park. Sustainable energy has been included in the conceptual master plan for Freshkills Park from the start. The methane gas that is generated by the landfill below the cap (enough to heat 22,000 homes) is already being sold to a local utility. And the potential for renewable energy generation above the landfill cap is enormous. But this specific context requires special considerations, and the promise of a public park as beautiful amenity creates a unique opportunity to explore creative ways of harnessing natural energy resources. There have been proposals for wind turbines and solar panels to be installed on the site. But a number of factors may need to be considered before embarking on a standard approach: the proximity to residential neighborhoods, the foundation restrictions of the landfill engineering, the desire to protect the natural environment, birds, and animals, and the promise of Freshkills Park as a place for recreation and enjoyment. We propose that artistic renewable energy installations can provide the perfect answer, by blending utility, beauty, and education, while conforming to the design restrictions of landfill mediation and conserving the local environment.